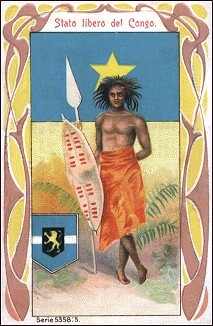 When the Congo Free State was formed in 1885, its flag, reputedly designed by the explorer H.M. Stanley, was blue with a gold star in the centre. One explanation of its symbolism was the light of civilization (i.e., the star) shining in the darkness of Africa. No change was made to the flag when the Free State became Belgian territory in 1908. I am writing on the flag used by the Congo Free State. According to J Roland and E Duchesne, Cours Complet de Geographie, Le Congo Belge, Namur 1914, p.9; the Congolese flag had been hoisted since 1877 by the Association Internationale Africaine (presided by King Leopold of Belgium) founded at the Brussels Geographic Conference (1876). "Two months after the closing of the conference [that is: April 1885], Leopold II requested, conforming with the Belgian constitution, and obtained from the Chamber of Representatives and the Senate the authorization to become the Sovereign of the Independent State of the Congo. One of the first acts of the new state was to declare itself perpetually neutral. It adopted a blue flag with a golden star in it's center, which the International African Association had hoisted since 1877." It appears from those pages that Stanley was very busy traveling, exploring and civilizing and that he had hardly time to do some flag-designing. And I haven't found the reference to the mysterious African prince. At http://digilander.libero.it/breschirob/congofig.jpg (as an illustration in Berschi's site at http://digilander.libero.it/breschirob/aggiorna.html), are shown some pre-independence symbols of Belgian Congo: flag, Coat of Arms and traditional costume (?). The flag is the well known big yellow star on blue and the Coat of Arms is (a shield with parallel sides and triangle tip) azure a fess argent, overall on an escutcheon Sable a lion rampant Or. The said escutcheon shows the same armorial bearings as in Belgian royal flags, which is consistent with Belgian Congo's official status: not a colony of Belgium but the personal property of the Belgian King. The blue background with a white stripe may be influenced by the (pre-existing?) blue flag with the stripe standing either for the equator line which crosses the territory or for the eponymous river Congo/Zaire. municipal flag of Kinshasa (former Leopoldville). Chapter 14, p. 243 : In 1884 King Leopold of Belgium was looking for international recognition for the newly invented flag of the International Association of the Congo. Pakenham adds that the design of a blue flag with a gold star was "borrowed from the old kingdom of Congo in Angola", a fact that is not mentioned in any of your articles. Unfortunately, although the book is footnoted, this reference is not. From a series of Cigarette Silks Iron-on Transfers, the subject of which is: Nation Animals & Flags, the flag of the Belgian Congo.